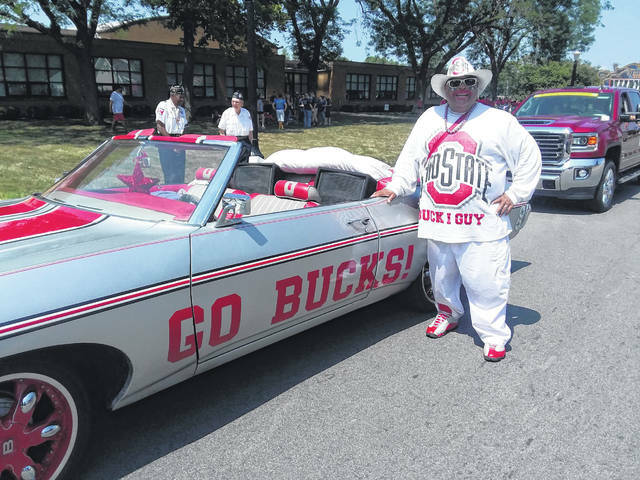 Buck I Guy stands next to his tricked-out car prior to the Jr. Fair Parade. 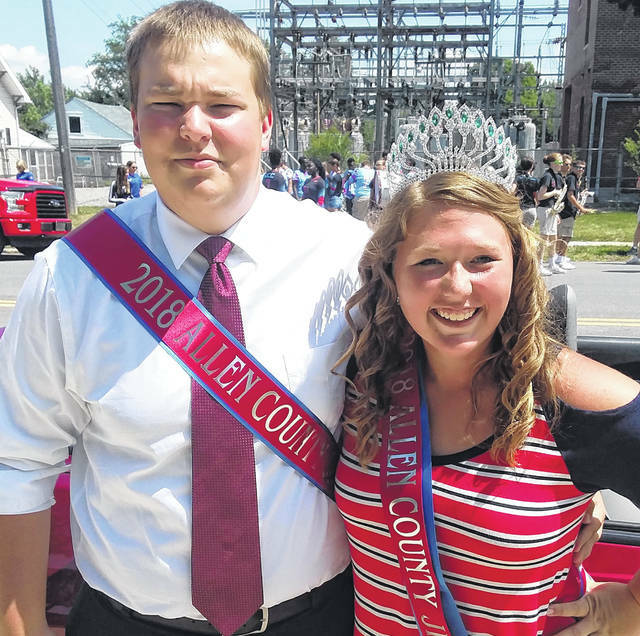 Allen County Fair King Stephen Parthemore and Queen Mallory Austin are overseeing this year’s fair. Myra and Harry Shutt were the Grand Marshals of the Allen County Junior Fair Parade. Eight year-old Hayden Gossard of the Auglaize Ag Cloverbuds smiles at spectators during the Allen County Fair Parade Sunday in downtown Lima. See more photos from the Allen County Fair parade. 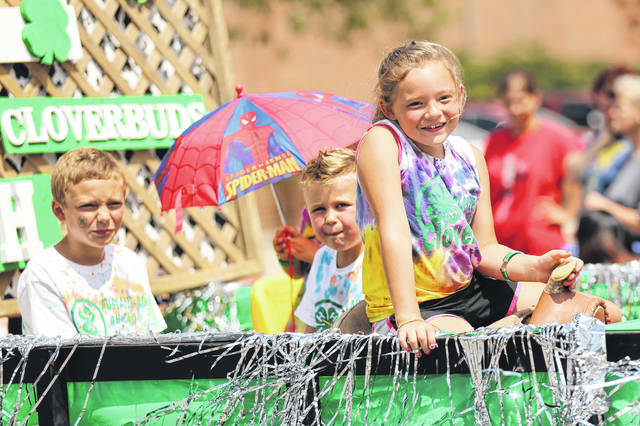 LIMA — Nearly 90 units were in this year’s Allen County Junior Fair Parade, which made its way through downtown Lima Sunday. Area marching bands, local businesses which support the fair along with various 4-H organizations made up the bulk of the parade participants. Stephen Parthemore and Mallory Austin are this year’s Allen County Junior Fair King and Queen. “It’s pretty cool. I’m just setting an example for the younger kids, see what they can do in 4-H,” said Parthemore. “I think it’s awesome because the little kids look up to you and then they think, ‘One day I want to be like you,’” Austin said. Austin remains active in 4-H as she is showing her pigs at the fair. “4-H is a great place to meet friends from all over the county. You get to learn how to be responsible and take care of your animals and time management skills,” Austin said. Parthemore shows dairy and dairy beef animals at the fair. “I feel like 4-H teaches you a lot. You can take farm projects like animals and such and you can take other projects like cooking, electrical things, robotics stuff like that. There’s a little bit for everybody,” Parthemore said. 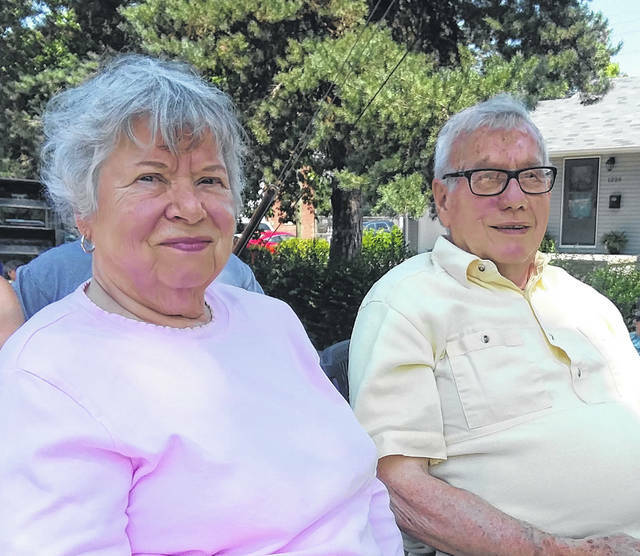 This year’s Grand Marshals were the Shutt Family of Kewpee Restaurant fame. “We’re very much honored. We’ve been very active in the fair for many, many years. We enjoy the fair. We look forward to the fair and it’s one of these things it just kind of starts the fall off,” said Harry Shutt. The Shutts have been big supporters of the marching band competition at the fair. “These kids work hard but they don’t get a lot of recognition, and this way the fair and the parade gives them some recognition other people are going to see them other than just the football fans,” said Shutt. “The parade is just the kickoff to the fair. It’s to get everybody excited and know that the fair is coming and get them all pumped up. We got some exciting things. It’s the 55th year for the mounted posse to be a part of the Sheriff’s Department and we brought the ‘Buck I Guy’ in. He’s going to be out at the fair this week promoting Ohio State and just a lot of exciting things. Many of the local bands participate, it’s sort of the kickoff to the school year, too,” said Don Kimmet, vice president of the Allen County Fair Board. ‘Buck I Guy,’ or John Chubb, drove his Buck I Guy Mobile in the parade. “It’s a 1970 Chevy Impala — all tricked out. We’re excited and happy to be here in Lima. The Allen County Fair is coming up and I’ll be back for it too,” he said. The Allen County Fair begins on Friday.